At 6:23 p.m. on February 14, 1943, a U.S. Army B-25C, twin-engine bomber, (#42-53401), left Rome, New York, en-route to its home base at Otis Air Field in Falmouth, Massachusetts. The temperature that evening was well below zero, and snow was falling. Near Albany, New York, the aircraft encountered blizzard conditions and was forced to turn back towards Rome. As the plane flew over the Mohawk Valley it is speculated that the pilot began looking for a place to make an emergency landing because witnesses remembered hearing the plane circling, and seeing a pink flare light up the sky shortly the B-25 crashed in an area of the town of Litchfield known as “Cranes Corners”. The crash occurred at 7:25 p.m. on the farm of John Wheelock. (Contemporary maps show a Wheelock Road in Litchfield.) According to one newspaper account, “The bomber, which plowed though the snow as it crashed, burrowed through the field and skidded along to the road, stopping less than 200 yards from the Richards’ home.” Debris was scattered over a wide area and the plane burned on impact. There were no survivors. Volunteer fire crews from the town of Ilion, (which is about six miles to the north), arrived with great difficulty, hampered by mounting snow drifts, sub-zero temperatures, and gale-force winds. A snow plow from the town of Litchfield managed to clear a path to the site. Many of the first responders, which besides the firemen, included state and local police, and military personnel from Rome, suffered frostbite due to the extreme weather conditions. 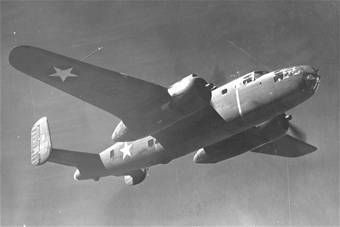 The B-25 took down power lines which left many area homes in darkness. (Pilot) 1st Lt. John R. Rogers, of Gouverneur, New York. (Co-pilot) 2nd Lt. Richard Lee Vance, of Scraggy Neck, Cataumet, (Town of Bourne) Massachusetts. He was 21-years-old. he’s buried in Greenlawn cemetery in Columbus, Ohio. The men were assigned to the 14th Anti-Submarine Squadron stationed at Otis Field. With thanks to the Ilion Free Public Library, Ilion, N.Y.